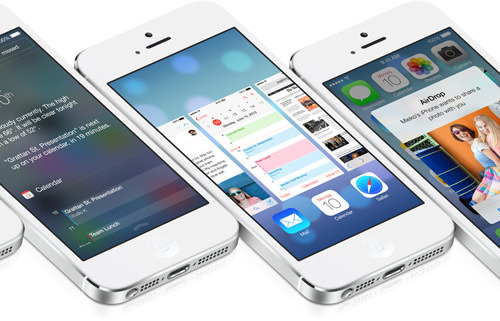 Apple iOS has gone through 6 versions and now we are getting iOS 7. 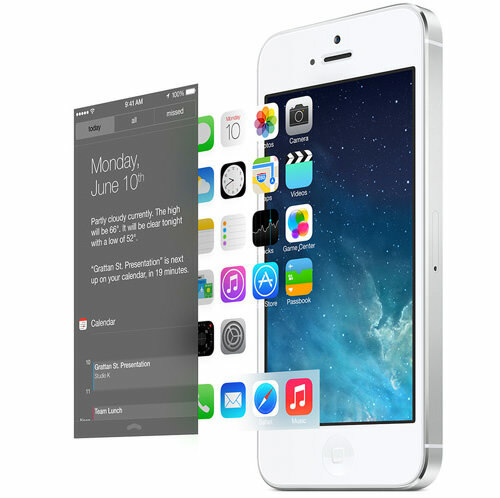 Announced at the WorldWide Developers Conference (WWDC) 2013, iOS 7 aimed to please with its massive redesign and fancy new features. 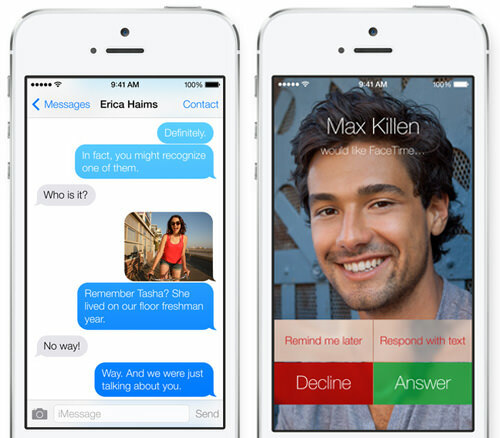 It’s time to quench those rumors and check out what iOS 7 (beta still) has for iOS users. While developers play with the beta version of iOS 7, which will be released for iPhone 4, iPhone 5, iPad 2nd generation and above, iPad Mini, and the 5th generation iPod touch, let’s check out what made the cut, what got updated, and the juicy details behind this latest update to the world’s most advanced mobile operating system yet. iOS has been redesigned, from the app icons and colors to typography, buttons and the general outlook — everything is simple and clean. The homescreen wallpaper uses gyroscope hardware to give the background picture a parallax effect. As you move your device, you can clearly differentiate the homescreen layer from the app icon layers, and this works throughout the system. Translucent design on the keyboard as well as system-wide (Mail, Messages, Calendar, Game Center) are present throughout the OS; you get a view of what is happening at the back. Swipes form the left edge of the device brings you to the previous menu or back to the previous webpage. Pages for app folders have also been implemented, perfect for your ton of gaming apps. The Notification Center now works on the lockscreen and also has a new look. You can see today’s notifications, missed notifications or all notifications through the buttons at the top. Calendar events are accessible with a single swipe all the way to the top. Access settings and options in a heart beat with Control Center. Swipe from the bottom of the screen to access settings like WiFi, Bluetooth and also change brightness and control music playback. 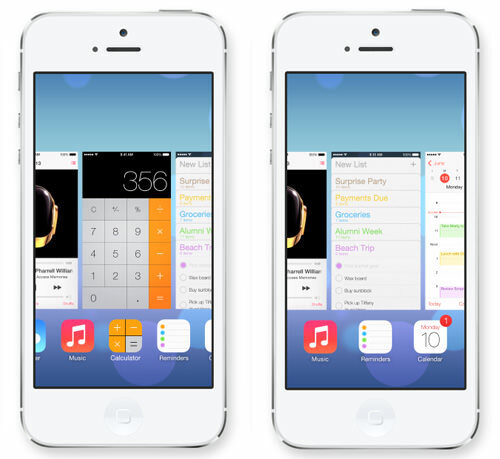 Control Center also allows you quick access to a few apps like the camera and calculator. It also lets you turn on the flashlight, and since Control Center works on the lockscreen, you’ll be able to turn the light on to find things in the dark without the need of finding an app. Orientation lock and volume slider are also on the Control Center. Multitasking now lets you peek at the apps which are opened. Slide through all the app previews and double tap on a preview to launch the app. iOS 7 recognizes your app usage patterns, and will allocate more resources for your favorite apps even with other apps open helping you to improve battery life. It’s even intelligent enough to know that you’re going to use Instagram around lunch time and will allocate resources for that behavior. There’s also Intelligent Scheduling that works with networks where it will only push updates for an app when you have a strong network connection. 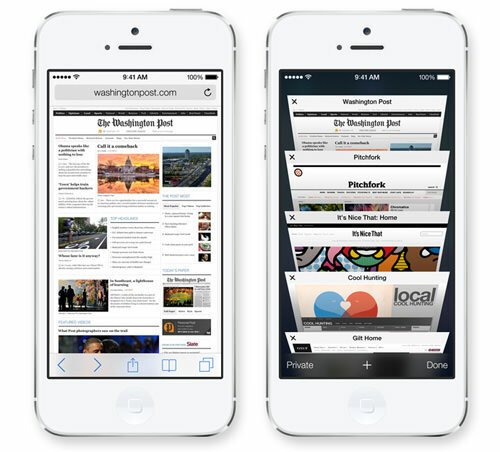 Browsing the Web on Safari now is better with its automatic full screen mode. As you scroll down through content, the address bar that you normally see will be minimized to only show the website name. The buttons at the bottom will also be hidden until you scroll up to reveal the controls. The address bar doubles as a search bar with new features: typing in part of a word will show you the Top Hit and also shows other Google search suggestions. You can now open unlimited tabs on Safari. Scrolling through multiple tabs looks like you’re scrolling through a file cabinet, where you can only see the top. Just tap on the website to open it, tap and hold to rearrange the tabs or swipe it to the right to close it. iCloud Keychain that saves password throughout all your Apple products featured on the new OS X Maverick is also integrated to Safari for iOS. Shared links by your Twitter followers are also convieniently located next to the Reader tab which syncs throughout your other devices. 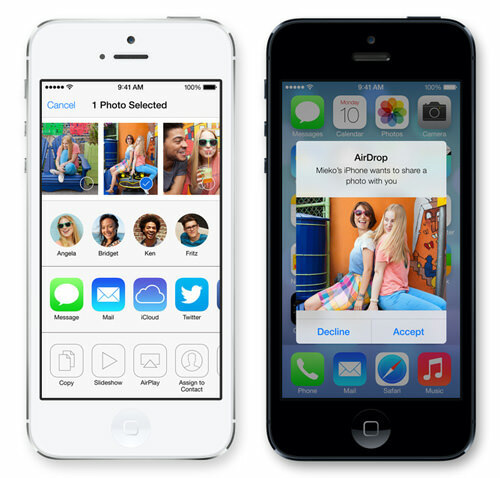 Since it uses new hardware, AirDrop only works on the iPhone 5, 4th-gen iPad, iPad mini, 5th-gen iPod Touch. The camera app now comes with 4 features accessible by left or right swipes: Videos, Photos, Photos in a square frame (for instagram) and Panorama pictures. New filters have also been added to the camera app on top of the basic editing features that is already available. 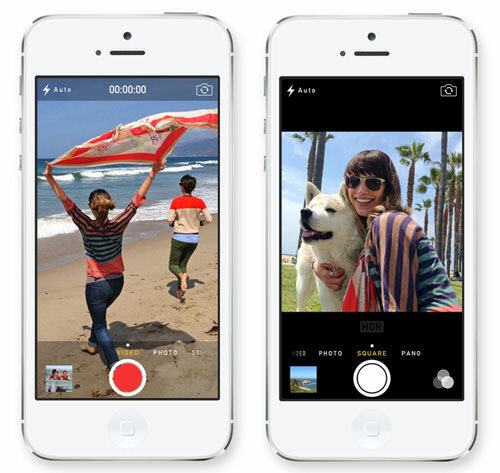 The Photos app also auto organizes your photos into moments based on location and date. It shows the location name and date when you first enter the Photos app. You can then pinch to zoom out and view collections where it sorts by locations only. Zooming out again then shows you the photos taken, sorted by year. It can roughly tell you highlights of each year like you visiting another country for holiday. You can then tap, hold and swipe your finger across the small pictures for a quick view. 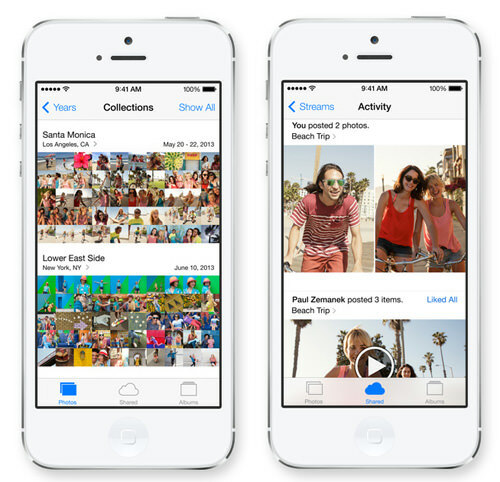 Share pictures on iCloud photo stream of your family. You can also access shared photo streams and view comments on pictures and shared videos through the Share tab that looks like a social network feed. 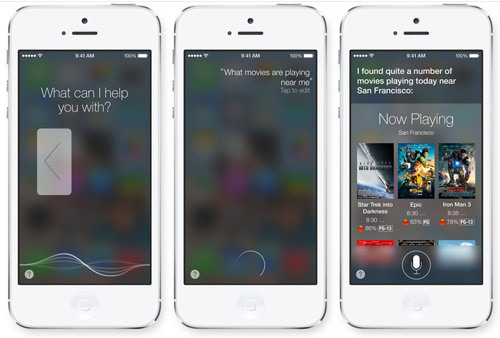 Siri is now smarter with integrated Wikipedia and Bing support built in for your search queries. There’s also Twitter where Siri can check out what your friends are saying. Other than Siri’s new look with the soundwave, it now shows results in a cleaner way. Siri now also has a male voice, and can speak to you in French or German (more languages coming soon). Voice commands are also available for actions like "play my last voicemail", "turn on Bluetooth" or "increase brightness". 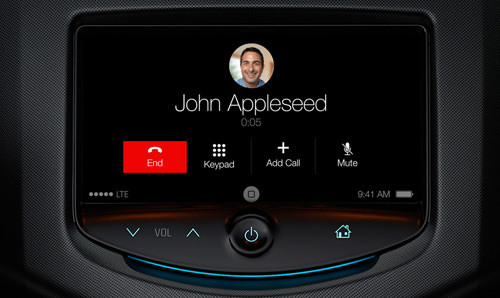 Because of these voice commands that let you change settings on the system, Siri will be integrated into 12 car manufacturers in 2014, which leads to the new feature called iOS In The Car. With the powerful voice commands, you can easily call someone, play music, get directions with Maps or have messages read to you without you having to look at the car’s center console or iOS device. 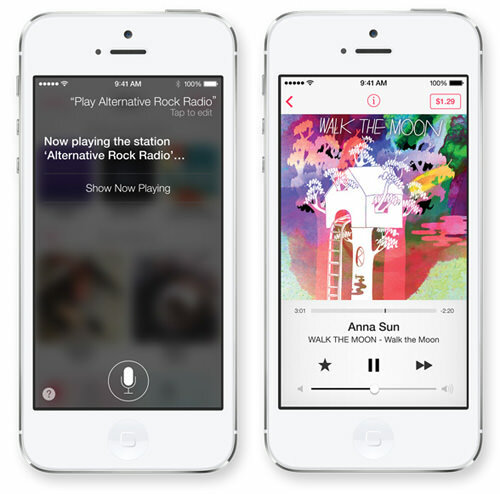 Apple now has its own Radio app similar to services like Pandora. It’s built into the new Music app where you can see featured stations or songs that are trending on Twitter. 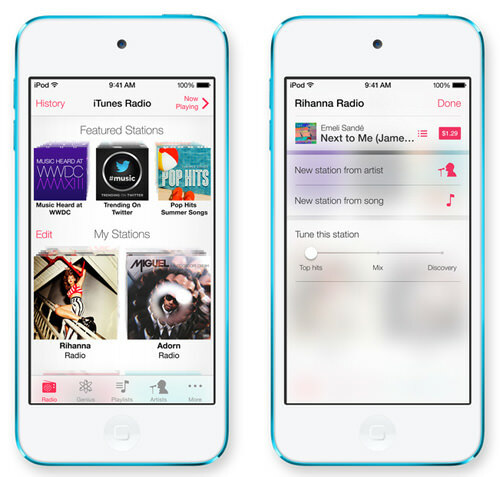 You can create your own stations based on music genre or your favorite artist and then share it with your friends. While music is streamed to you, you can choose to "play more songs like this" or "don’t play this song" and it’ll intelligently tweak the playlists further. It keeps track of all the songs that you listen to on the History tab so you can opt to purchase it later. iTunes Radio is also available on your Mac, PC or Apple TV and is free with ads unless you’re a iTunes Match subscriber. With the Music app update, you can see all your purchased music, movies and TV shows over iCloud on your device. Landscape mode also shows you all your album covers where you can just tap on a cover to start listening to it. 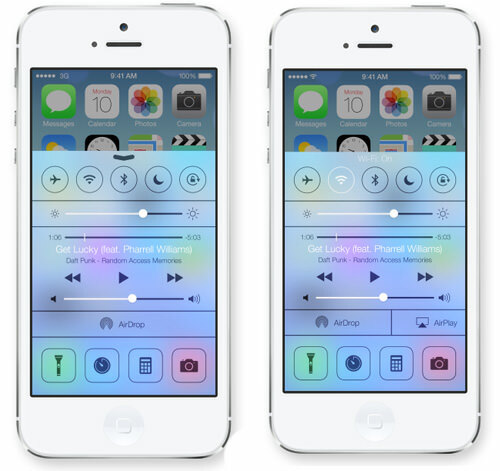 Here are a few more interesting things that you might want to know about iOS 7. The App Store has changed where you can look for apps based on age range and view popular apps around you. Apps now also auto-update. FaceTime will also feature audio only calls together with the ability to block numbers so they can’t reach you over the phone, FaceTime or messages. 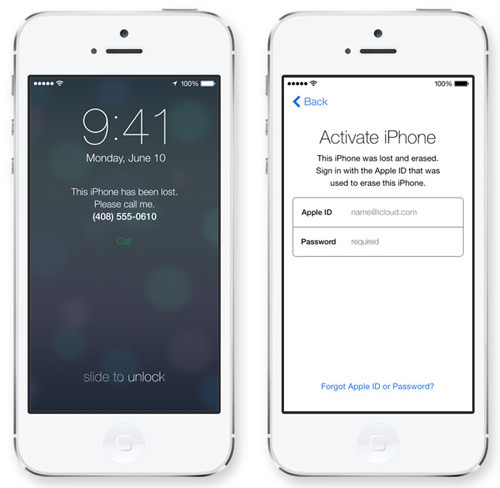 Find My iPhone has an update with Activation Lock. Even if someone disables Find My iPhone or wipes the entire device clean, they won’t be able to use it as your iCloud user ID is required to use your device. Notification syncing is also a new feature where notifcations that you’ve cleared will be gone throughout all your devices. Tencent Weibo will also see more integration on iPhone. Also, 1500 new APIs will be released to developers to integrate all the cool new features and looks of iOS 7 to their apps, so expect more features to turn up when iOS 7 comes to your iDevices this fall.